Our range of products include 25 kva step down transformer, 20 kva step down transformer, 15 kva step down transformer, 30kva step down transformer, 75kva step down transformer and 80kva step down transformer. We are providing 25 KVA Step Down Transformer. We are providing 20 KVA Step Down Transformer. We are providing 15 KVA Step Down Transformer. We are providing 30KVA Step Down Transformer. We are providing 75KVA Step Down Transformer. We are providing 80KVA Step Down Transformer. We are providing 35KVA Step Down Transformer. We are providing 40KVA Step Down Transformer. We are providing 50KVA Step Down Transformer. We are providing 60KVA Step Down Transformer. We are providing 90KVA Step Down Transformer. We are providing 100KVA Step Down Transformer. We are providing 150KVA Step Down Transformer. 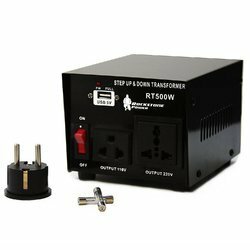 We are providing 1KVA Step Down Transformer. We are providing 2KVA Step Down Transformer. We are providing 3KVA Step Down Transformer. We are providing 5KVA Step Down Transformer. We are providing 6KVA Step Down Transformer. We are providing 7.5KVA Step Down Transformer. We are providing 10KVA Step Down Transformer. We are providing 15KVA Step Down Transformer. We are providing 20KVA Step Down Transformer.